The London Literature Festival is in town. This wildly bookish event fills the South Bank with acclaimed authors (like the legend Margaret Atwood), poets, speakers and wordsmiths for a fortnight of scholarly talks and other fantastic wordy events. To mark this literary extravaganza, we thought we'd get to know a little bit more about one of the city's top bibliophile retreats, the British Library. This ginormous library in Euston is hands-down the undisputed king of them all. Here are 12 awesome things you probably didn't know about it. The library also archives the UK's web domain. Last year, it collected 68 terabytes of web data – that's an estimated 2 billion web pages. It's all kept on 625km of shelves, which are spread over 14 mammoth floors – nine above ground and five below. 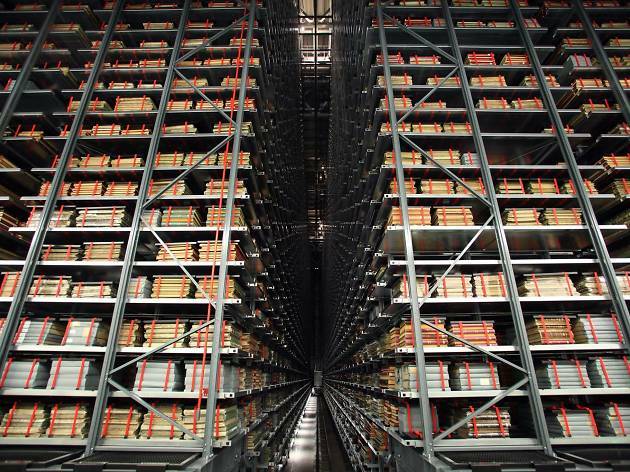 They can't fit it all in London, so another library and storage facility was built in Boston Spa in West Yorkshire to house all the other awesome literary relics, including the UK National Newspaper collection (pictured below). Here, 60 million newspapers, spanning three centuries are kept in really neat low-oxygen storage chambers. When a reader orders something, the librarians use these cool purpose-made robots to grab things as quickly as possible for researchers up and down the country. 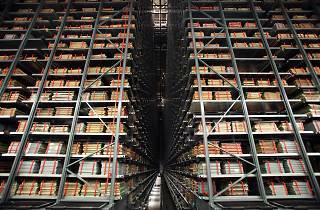 All the storage rooms at the British Library are kept under strict controlled environmental conditions. The bulk of it all is shared across four very cold double-tier basement levels. Millions of books, manuscripts, maps, stamps, drawings, postcards, audio recordings and images are carefully arranged and coded in special metallic pull-out bookcases. The most precious publications are stored in inert chambers of nitrogen, carbon dioxide and argon (to protect against any potential fires), because sprinkler system + medieval manuscript = total disaster. Whenever a reader requests something on the online reservation system, some lucky worker in storage grabs the ordered item, puts it into a barcoded red crate and carefully places it onto a series of conveyor belts and paternosters until it reaches a stressed-out student in one of the reading rooms. Around 65,000 volumes of printed books and more than 19,000 pamphlets call this super-shiny glass-encased library their home. The King's Library also holds the most significant ensemble of writings from the Enlightenment period in the land. The books in here are so rare and so precious that they are protected by a special layer of UV filter glass (that's why your pics of it are so glaring), which combined with the ultra-cool environmental control system, helps maintain optimum light, temperature and humidity levels. Whilst not accessible to us normal folk, treasures of the King's Library include a copy of the Gutenberg Bible and Caxton's first edition of Geoffrey Chaucer's 'Canterbury Tales' (pictured below). If you really wanna see the gems in here, become a library member and request to see a few of these beauties for yourself in the 'Rare books and Manuscripts' reading room – you won't regret it. The London Literature Festival runs until October 16. Find more cool events happening in October. My name is Claudio Carral,iam from Argentina , and i was there in 2012 with my daughter and wife it¨"s a wonderful expirience ! Very Interesting! I never did know anything about the Library! Treasures of the British Library, a new six-part series for Sky Arts broadcast 18 Oct - 22 Nov, sees six famous artists taking personal tours of the British Library’s fascinating collections. Included are acclaimed trumpet soloist Alison Balsom, jazz singer-songwriter Jamie Callum, children’s author Julia Donaldson, actor and writer Meera Syal, professor and television presenter Lord Robert Winston, and poet Benjamin Zephaniah. At the end of each episode, the contributors gift something personal of their own to the British Library collection. It was the largest building constructed in the UK in the twentieth century .